As I sat on a bench atop Narkanda’s (नारकंडा) Hatu Peak (हाटू पीक), gazing at the distant snow-capped mountains, my mind was occupied with but one thought: what must it feel like to stand at the foot of those lofty mountains? Even from a height of 3400 metres (11,152 feet) where I was, the mountains appeared to go far high into the sky (for perspective, Rohtang Pass (रोहतांग पास) is at an elevation of 3978 metres/13,050 feet and Mt. Everest at 8848 metres/29,030 feet). It was an uplifting experience, and a humbling one too. Looking at mountains, Himalayas especially, always is for me. View of the Greater Himalayas from our hotel room in Narkanda. The white conglomorations on the hill just opposite are the apple orchards of Kotgarh. The slight haze that stood between us and the distant long and tall range of the Greater Himalayas was a bit of a let-down. A day before, when we had arrived in Narkanda, the view had been so much better even from our hotel room, which was several hundred feet below the peak. The sky, nevertheless, was a beautiful blue, with light streaks of clouds here and there giving it an artistic feel. 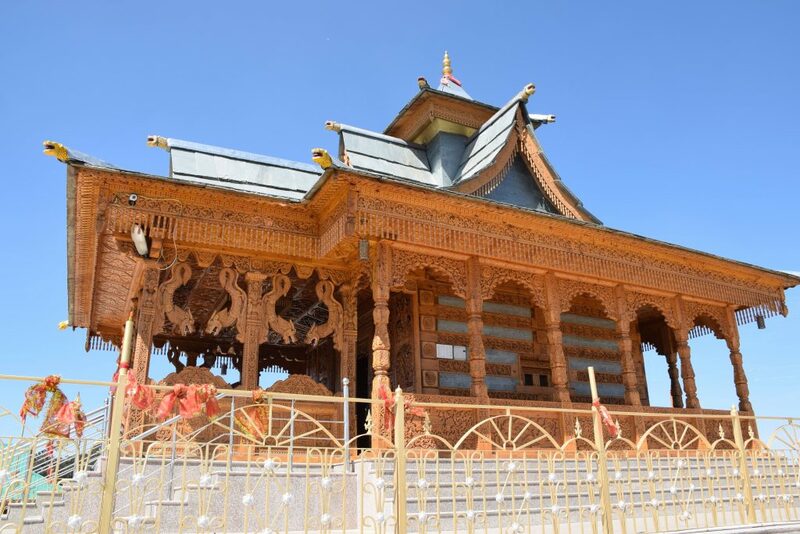 Hatu Peak is famous for two things – its wood-and-slate, Himachali-style temple dedicated to Goddess Kali and the 360⁰ view it offers of the peaks and valleys far and near. On both these fronts, it did a good job of impressing us. The wood-and-slate Hatu temple at Narkanda. Slate is a commonly used building material in Himachal. Above: A portion of the ceiling of the Hatu temple. 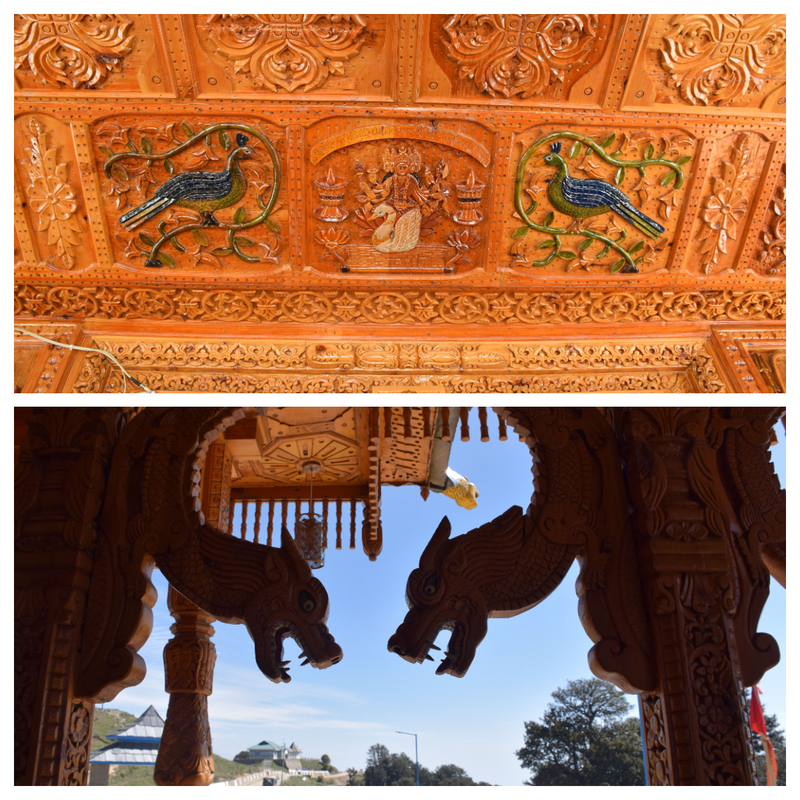 Scenes from different scriptures are carved out all over the ceiling and the walls. Below: View from the inside. It’s hard to figure out who started the misinformation, but the internet is full of it, that Hatu Temple is dedicated to Ravan’s wife Mandodari. It is not. There was nothing at the temple giving any background information; so I decided to check the veracity of the story with the temple priest. He told us the folklore has it that Draupadi, the wife of the Pandavas, went into samadhi at this place. As such, the temple is dedicated to her, and she is worshipped in the form of Goddess Kali. He expressed concern at the Mandodari myth making its way to more and more websites and said the temple caretakers had initiated some measures to get it rectified. Given that there are communities in India that worship Ravan, a temple made for Mandodari does not seem far-fetched, which explains why the myth has found ready takers. 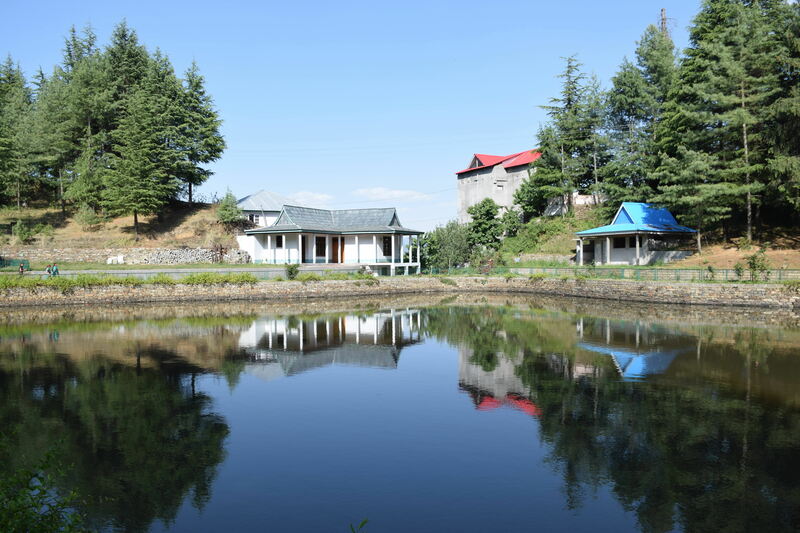 Hatu Peak is no more than 7 kms away from Narkanada – a tiny town of few shops and fewer hotels. A 6 km-long winding and really narrow road that branches off on the right from the main road takes you to the peak. We have been on some really scary, tight roads in Himachal, but this one was the scariest of them all. The most dangerous ones are found in Lahaul-Spiti (लाहौल-स्पीति) and Kinnaur (किन्नौर), of course, and we haven’t been to those places yet. Suffice it to say, we were nervous both on our way up and down. There is room enough only for a car or an SUV to pass through at a time, except at the turns, where alone can two vehicles pass each other simultaneously; not without caution though. The good thing is the road is never too steep. 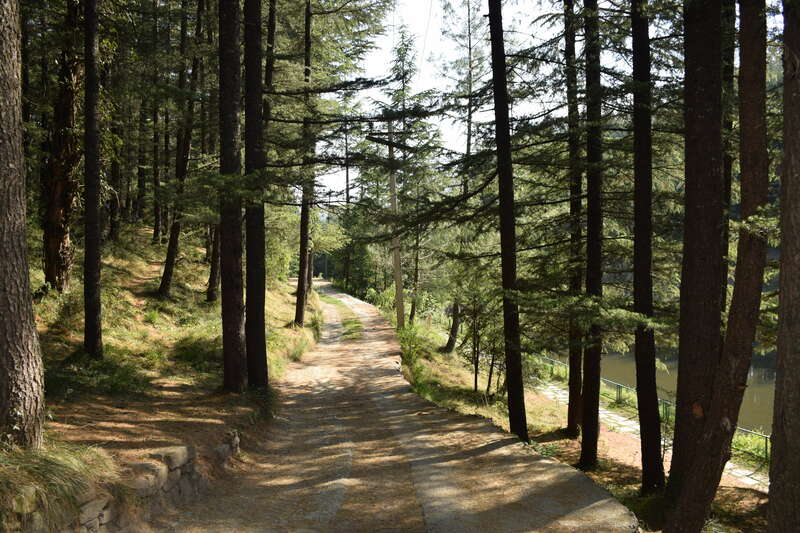 Add to this the fact that there is a dense vegetation of deodar and pine trees lining the road. Should a vehicle lose control, I am certain the trees would not let the poor thing plunge into the ravine. That’s just me imagining things though. Don’t get too adventurous! There takes place a one-day mela each year at Hatu Peak in the month of May/June (If my memory serves me right, the priest told us it happens on the third Sunday of the month of Jyestha as per the North Indian Hindu calendar. So, the date varies every year). The Chief Minister is always the Chief Guest, and the event is very popular with the locals, which means the place sees a crazy amount of traffic on that day. On a tight road like that, imagine what that means! This year the mela happened to fall on the 19th of May – the day we arrived in Narkanda. I had no idea whatsoever about the fair when I planned our Narkanda trip; luckily, I had fixed 20th for our drive up the peak. We learnt that the police manages the traffic very efficiently on the day of the fair, letting the uphill and the downhill traffic take turns to move in spurts of 30 minutes each. Himachal has a very rich tradition of local fairs happening in different places on different occasions round the year. If you are inclined to get a taste of the local culture and don’t mind large crowds, the Hatu fair may be a good opportunity to immerse yourself in the spirit. If not, enquire with your hotel before making a reservation as to the date of the fair, and plan accordingly. The distance from Shoghi to Dhalli via NH-5, that is, through Shimla is 28.9 km. The bypass, with its distance of 34.5 km, is longer, but cuts out the notorious Shimla traffic and saves you precious travel time. Since we went to Narkanda during peak tourist season, we decided to bypass Shimla. Going through Shimla would have meant getting stuck in traffic and reaching our destination some two hours late. About 15 kms before Shimla on NH-5 (previously NH-22), at a place called Shoghi (शोघी), starts a road that takes you to Dhalli (ढली). This bypass is actually longer than the highway but carries negligible traffic, shortening the travel time considerably. Somewhere along the road, we stopped to feast on our lunch of melons and homemade sandwiches. Ma spotted shrubs full of heer (हींर / yellow Himalayan raspberry) and got all excited. We spent a couple of minutes collecting and snacking on the berries. My parents grew up eating wild fruits like heer, kurundu (कुरुन्दु / English name? ), daugle (दाऊगले / wild figs), tyambal (त्यांबल / English name? ), kainth (कईंथ / wild Himalayan pear), kashmal (कशमल / daruhaldi / Indian Barberry), and daadu (दाड़ू / wild pomegranate). Any opportunity to grab a few pieces always excites them. I was quite keen on making a halt at Mashobra (मशोबरा), having never visited the place before. The President of India was to arrive there the same day for his annual summer retreat, resulting in police being visible in every nook and cranny. We only had to take a short detour; so I was able to convince my family to make a brief stop. We didn’t spend any time at Mashobra, however, as it looked no different from any of the many thickly wooded areas of maintown Shimla. Our exit from the town happened as fast as our entry. Who hasn’t tasted the delicious, juicy Himachal apples? Within a few minutes of getting out of Shimla suburbs, we entered into one of the two most famous apple belts of the state (the other being Kinnaur). 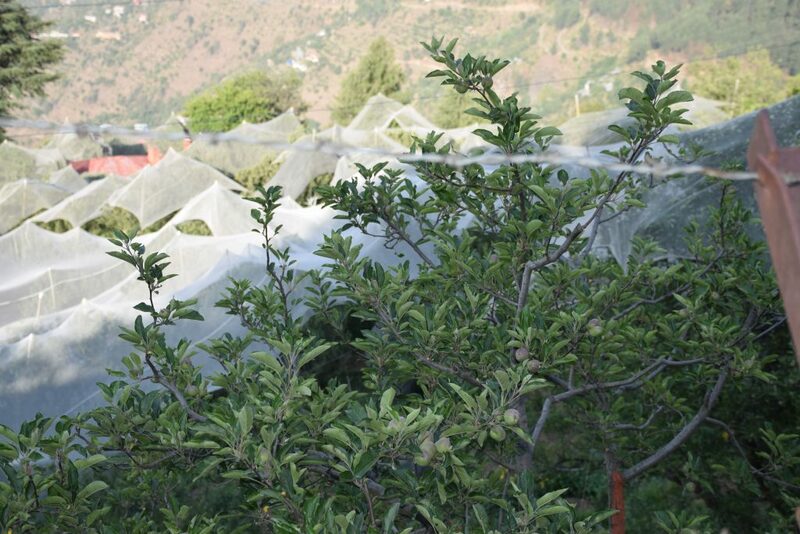 Orchards on the hill slopes, with trees covered with nets as protection against hail, began to show up now and again. As we neared Narkanda, the area under apple cultivation started to grow bigger and bigger still. The region is known for its cherries too, and the cherry trees were interspersed with the apple ones. We were daisy-fresh when we arrived at Narkanda. 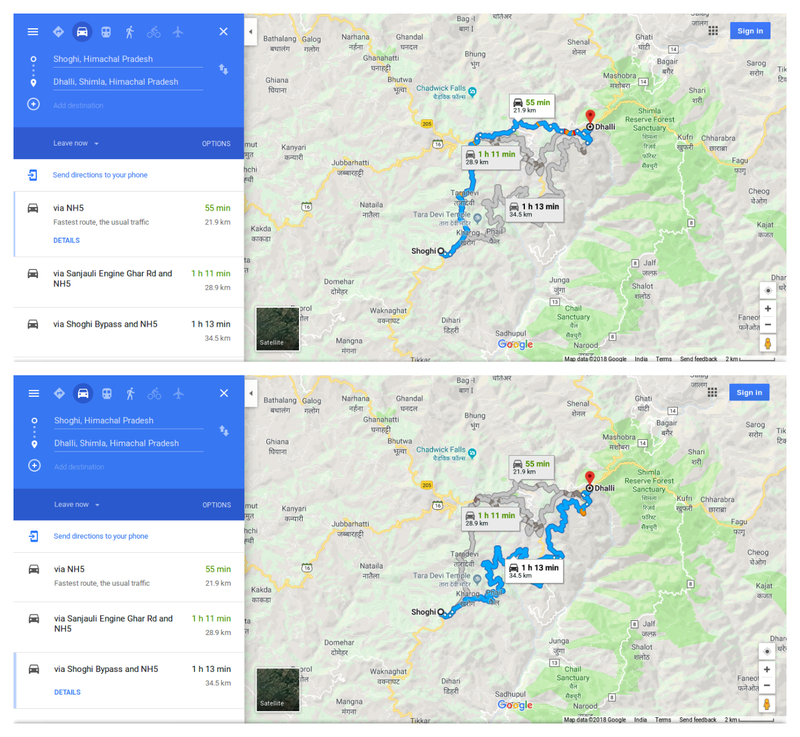 We checked in to our hotel, made some queries about the places we could visit to make the most of the remaining day, had delicious cardamom tea and left to explore Kotgarh (कोटगढ़) and Thanedhar (थानेधार), both at an equal distance from Narkanda. Kotgarh was visible from the hotel and looked white from the innumerable nets covering the fruit trees. On our way to Kotgarh, we made a 4-km detour to see Tannu Jubbar (तानु जुब्बड़) Lake. How this place divides people on TripAdvisor is amazing; quite understandably so. The water body is too tiny to be called a lake, and those who go there hoping to see a large lake come away disappointed. The thing is more like a pond, but one set against a picturesque backdrop. The woods are gorgeous. There are two walking trails – one around the lake; the other a little above, through the forest. A handful of benches here and there in the woods add to the charm. For me, Tannu Jubbar was a little piece of heaven, and if I lived in its vicinity, it would have had a loyal visitor in me. Tannu Jubbar Lake is a visual treat. What it lacks in size, it makes up for in beauty. The walking trails running through the densely wooded jungle surrounding the lake. Our next destination was Kotgarh. We rejoined the highway, which, just a little while later forked – a narrow, descending road on the left led to Kotgarh; the highway to Thanedhar. With Kotgarh on our mind first, we turned left. Several minutes of driving later, we became restless as Kotgarh village seemed to elude us. We realized we should have taken a left turn just as we exited Narkanda. The road we were on went to Kotgarh too, but it wasn’t as good as the other one supposedly, and it didn’t look like the village was within our reach anytime soon. Anxious to be able to make it to Thanedhar while the sun was still up and to be back in the hotel before it was too dark, we turned back towards the highway. Himachal has become synonymous with apples, thanks to an American who came to colonial India as Samuel Evans Stokes, Jr. but became Satyanand Stokes later and altered Himachal’s fortune forever. 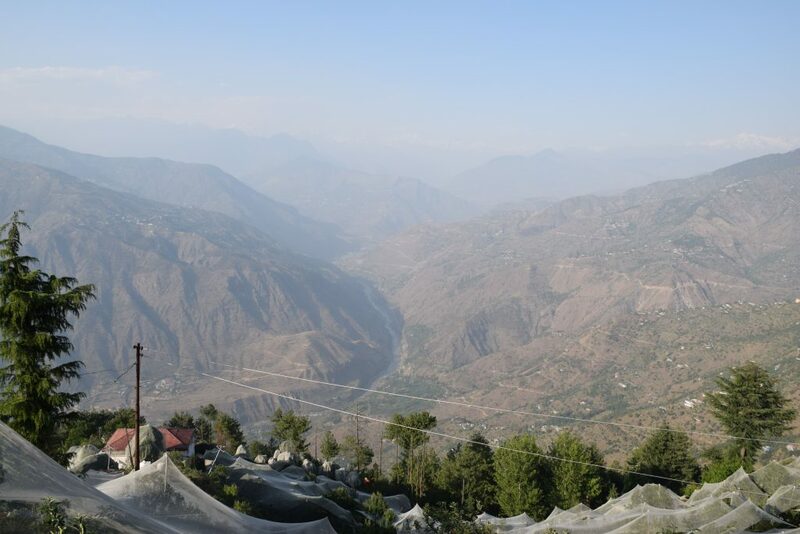 Stokes introduced apples to Thanedhar, from where the cultivation spread to other parts of district Shimla and further to Kinnaur and the rest of the state. Thanedhar is a small village of scattered, impressive houses. Apples have brought great prosperity to the entire region, and most people have two houses – one in their native village and the other in Shimla, where their kids study and where many of them do full-time jobs. The orchards are mostly looked after by labour from Nepal and UP and Bihar, who also happen to be the people running the handful of shops and restaurants in Narkanda. Early-stage apples at an orchard in Thanedhar. The white nets are an unmissable sight in the entire apple-growing belt. 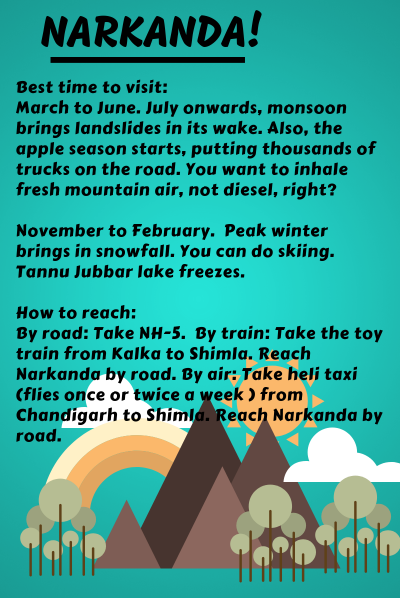 There isn’t much to do in Thanedhar unless you have any trekking plans. We passed through the village and drove on for another few minutes until we reached a point where a beautiful panorama opened up for us to savour. Papa, who has a good understanding of Himachal’s political geography, explained to us what we were looking at and what lay beyond. A local man passed us by, and we stopped him to enlighten us further. Talking to strangers in Himachal is mostly safe, especially in the really remote parts of the state. Things have started to change lately, and Himachal is not exactly the low-crime place it once was. But it is still safer than most other places in the country. Satluj river as seen from Thanedhar. On the left side of the river is Kullu – the district, not the town. On the right is Shimla; the district, you guessed it. The road running parallel to the river takes you to Rampur Bushahr and then on to Sarahan. Our excursions for the day were over, and we returned to Narkanda. There are hardly any restaurants there. Our hotel provided food, but we chose to explore Negi Dhaba, which was no more than a few metres away. The food was, well, dhaba-like – a little too spicy for our tastebuds even though we had requested them to tone down the spices a bit; but palatable nevertheless. Dinner over, we went for a stroll and spotted a statue on one side of the road. Dark as it was, I turned my phone torch on to discover it was that of Satyanand Stokes. A no-brainer, no? Back at the hotel, we asked if we could have Siddu (सिड्डू) for breakfast. Siddu is a fermented, stuffed and steamed bun that is popular in Shimla, Mandi and Kullu districts. It’s not made in the part of Himachal I am from, and none of us had ever had it. It was disappointing, then, that our request was politely declined. The next day we left for Hatu Peak at around 9 am. 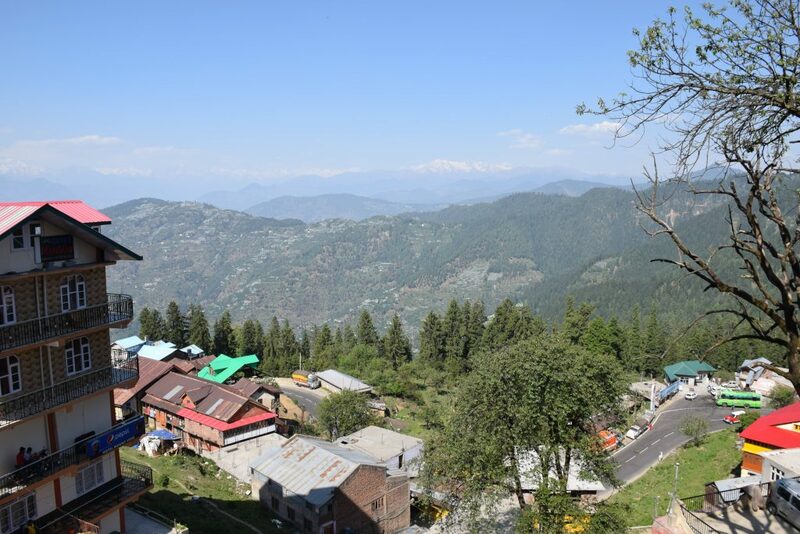 By 11, we were out of Narkanda, towards our next destination – Chail. There were many cherry vendors on the way, and we halted at a conveniently-located spot to pick up some boxes. We got the boxes opened to do the taste test and check for the quality. Satisfied, we purchased three – one for ourselves, one for the relatives, and another one for a family friend. When we got home and unboxed a carton, the discovery of worm after worm in cherry after cherry left us poorer by seven hundred rupees and richer for the experience. On our way to Chail (चैल), we once again bypassed Shimla – this time taking the link road between Kufri (कुफरी) and Chail. Kufri is a tourist magnet. In winters, it gets a decent amount of snow and gives tourists the opportunity to try their hand at skiing and go sightseeing on mule-back (maybe even yak-back). But summer is a terribly bad time to be there. And yet, a sea of humanity descends on Kufri each day of the long summer vacation period. Whatever for, I do not understand. We waded through the traffic, which, though overwhelming, did not restrict our movement but only slowed us down. The entire road from Kufri to Chail was in a very good condition and had very little traffic, making our drive enjoyable. On reaching Chail, the first thing we did was stop for lunch. In spite of being a crowd-puller, Himachal does a poor job on the food front. There is a lot I want to say in this regard, and I certainly will in a separate blog post. For now, let’s just say our experience at Chail was not good. 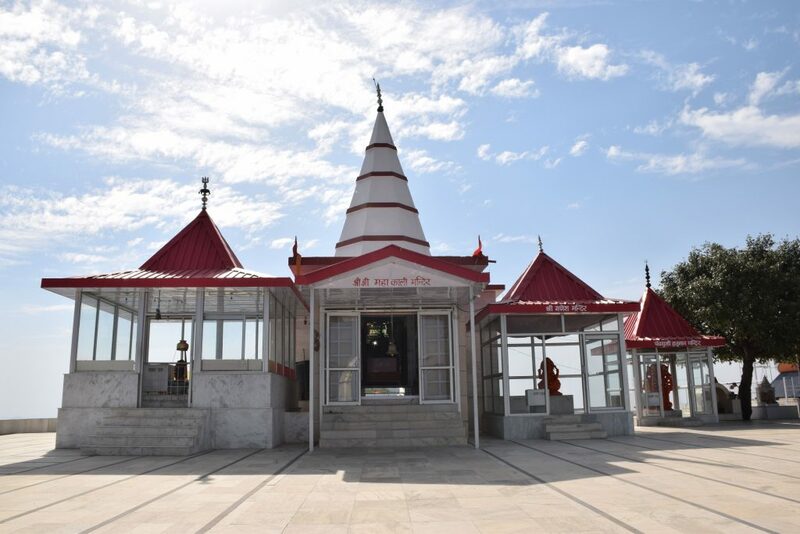 Kali Tibba temple on a hilltop at Chail. The temple is located not in Chail town itself, but approximately 7 kilometres away. We had returned to Chail after a very long time; so we could have done the usual tourist hangouts. But we chose not to. Instead, we headed right away for the Kali Tibba Temple, which is situated on a hilltop, and like the Hatu Peak, offers panoramic views. The road leading to the temple was in a remarkably bad condition and was getting redone at many places. It was safe to drive on nonetheless. The temple was our final stop on this two-day adventure. Except for the cherries, everything about the trip was sweet and memorable.